Colombia is a huge country, and it is much more than the old cliches of narco-trafficking and kidnapping. As the Lonely Planet describes it, it is a great cocktail consisting of caribbean atmosphere, the great mountains and glaciars of the Andes, the Amazon, the unique Tatacoa desert, cloud forest, colonial cities, indigenous, Afro-descendants and European cultures, and colourful and friendly people. Top all of this with a great, relaxed atmosphere and here is the perfect place. One could spend months travelling around the country, and still feel unfinished and wanting to explore more. Furthermore, some of the places to visit in Colombia are so isolated that no roads get there. Leticia – the main starting point for a visit of the Amazon basin – can only be reached by plane. By all means, I know I am an adventure seeker, and I know I have a choice of about a million places to visit in Colombia. But, since I was looking for some of the great Colombia tourist attractions combined with fun sports, I headed to San Gil. This is definitely THE place for extreme sports and I could easily fill up my days there with all sorts of activities, from rafting to rappelling, torrentismo (rappelling down a waterfall), horse riding, paragliding, caving, mountain biking, and so much more. The best thing to do for me, since I didn’t want to burn all my energies was to alternate any of these extreme activities with quieter ones such as swimming in natural pools (such as the Pozo Azul), visiting the nearby waterfalls (Cascadas de Juan Curi) and going on easy, nearby hikes. 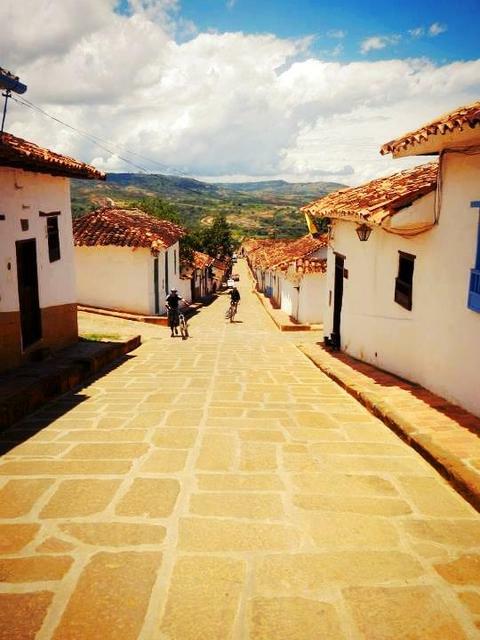 Although San Gill is small city, it gave me a pleasant and authentic Colombian feel and it is not crowded with travelers. I could enjoy its atmosphere fully during the day, at the local market, or after sunset, when the locals meet for evening drinks in the main square, children happily run around, and everybody is up for a chat. 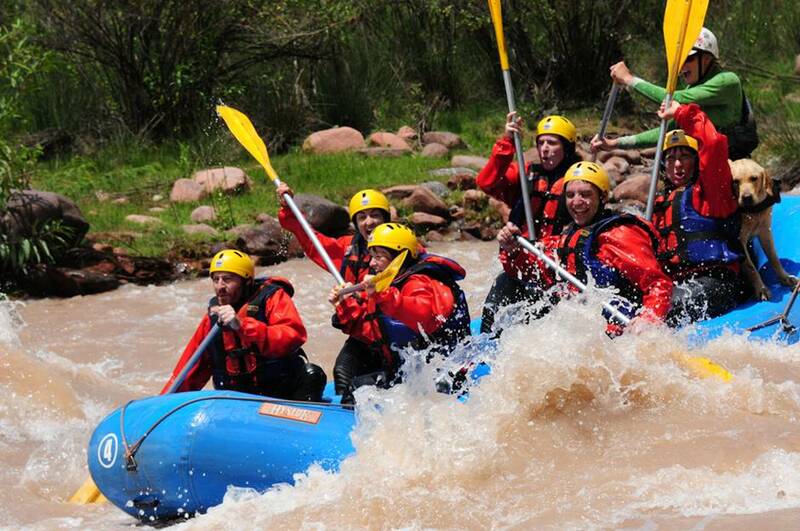 Among the things to do in Colombia, there is some great rafting. Many companies in San Gil organise whitewater rafting excursions. Unexperienced rafters may prefer opting for the easier Rio Fonce – with rafts of grades 1 to 3. I was in the mood for something more challenging, so I opted for the Rio Suarez: around 30 dollars for a full day (about 6 hours in total and snacks included, consisting of fresh fruit, local cheese, crisps and drinks). Colombia Rafting Expeditions is the most reliable company in town. I was picked up from my hostel and driven (about one hour drive) to the starting point. The English speaking guides are very experienced, and did everything to make my day memorable. After a briefing on safety measures, we started rafting down the river. We all got soaking wet, we got the chance to swim in the river carried away by the current, and we even had to get to shore to hike up for a while, and even jumping off cliffs. The only low point is that there is nobody taking pictures for the rafters, so I would advise to carry a waterproof camera. 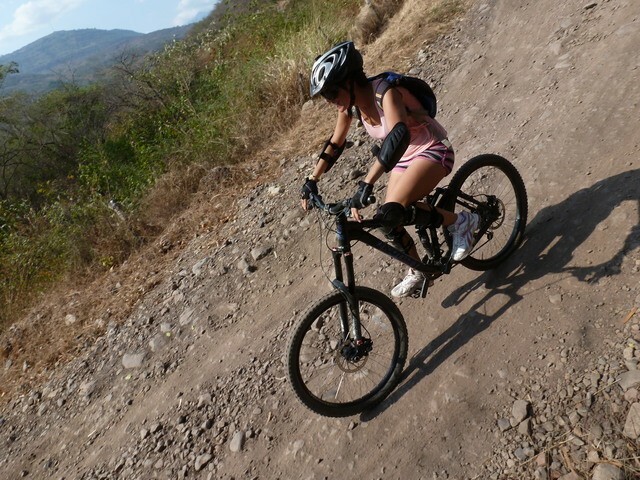 Another one of the things to do in Colombia is mountain biking. Mountain bike tours near San Gil go through the Chicamocha Canyon and they allowed me to visit the beautiful Barichara, an immaculately renovated city of white-washed buildings and stone streets, with a beautiful cathedral and a gorgeous and airy main plaza, which is definitely one of the places to visit in Colombia. The best company running the tour is Colombian Bike Junkies. It is based out of the restaurant Gringo Mike’s, which is also the meeting point. The trip lasts all day (by which I mean ALL day – do not expect to be back before dark! ), it costs around 60 dollars. Ok, that is not cheap but it possibly is the best and most fun among the things to do in Colombia and it is worth saving on other things to embark on this adventure. Colombia Bike Junkies is reliable, the bikes are in excellent state, and it is organised to the point that when I booked the tour, I was even asked where I wanted to have the front and back breaks, and even a meal preference (yes: a delicious lunch, snacks such as fresh fruit and home baked cookies and water are all included, as well as a “well done” beer after finishing) and my size, as at the end of the day I was given a t-shirt that will always remind me of this great adventure. 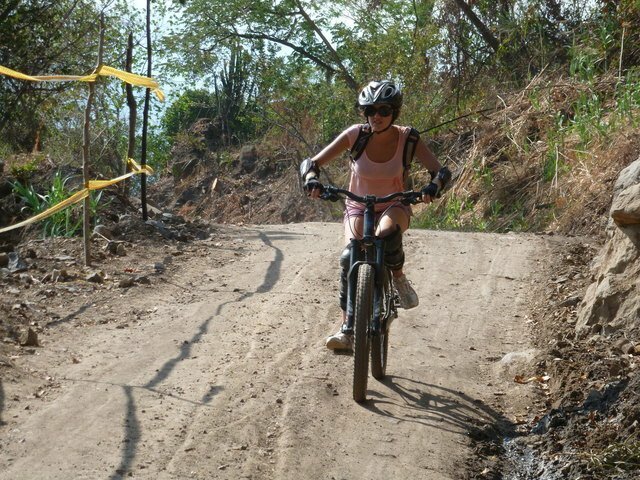 Things to do in Colombia: mountain biking! The 50 km trip will be tiring: going downhill is challenging for non-expert mountain bikers, yet it is a lot of fun. After the lunch break, the path is an easier (in technical terms! ), slightly uphill 16 km road. By the time I got to the finishing point, I was dusty, sweaty, dirty and, most importantly, happy and accomplished and that beer tasted oh so good! Open House Hostel in San Gil is an excellent option for backpackers. It is very close to the main plaza: it is clean, quiet, and it has nice, comfortable beds, an airy common area and very well equipped kitchen and a nice backyard. My humble advice is to cook at the hostel, as, other than Gringo Mike’s, there aren’t many good options to eat in town and the market sells lovely fresh vegetables and fruit. San Gil can be reached by bus from pretty much anywhere in Colombia. There are night buses from Cartagena (the trip lasts 17 hours and goes through Barranquilla); there are regular buses to and from Bogotà (8 hours, around 17 dollars), Medellin (11 hours, around 30 dollars) and Bucaramanga (2 hours), which is the closest airport. Looking for more things to do in Colombia? I’ll admit that I’m not the best biker, but the scenery looks beautiful. I’ve been considering a trip to Columbia for a while now. I just found out how cheap it is to fly there from Florida! I am not the best biker either, but I still like it a lot 🙂 Make your way there. With so many places to visit in Colombia, you’ll never be bored! Looks like a great trail. Also, the whitewater looks like good fun! It’s by far one of the best things to do in Colombia! Looks like a fun and challenging way to see the countryside. Colombia is a wonderful place to visit. I haven’t been to San Gil but will need to make a stop my next time through the area. Thanks for the suggestion! It doesn’t attract too many traditional tourists, yet it should be considered among the top Colombia tourist attractions! Colombia is definitely one of the best countries to cycle through! Extreme sports is what I live for so rappelling down a waterfall sounds like just my style!! We did a lot of cycling through Bolivia and loved it, looks fairly similar to your experience here – can’t wait to start planning a trip myself! Hey Meg, I did both the death road and this one here in San Gil. It is actually different – the one in Colombia is way more technical and for expert mountain bikers (in fact, I nearly killed myself a few times). Both worth trying for sure. Yes, I am like you: I love extreme sports!! What a cool spot! Looks like its for the true adventurer! I am seriously impressed with those bike skills. I got a tweet from someone who saw the cover picture – that bike was actually so heavy that the person who took the picture had to snap it VERY FAST!! great post! This makes me want to visit Colombia even more! I think I’ll wait until my boys are a bit older so we can enjoy all of these activities! I wish I was more adventurous – then this would be the place for me! Colombia is going to be a real hot spot in the near future, I can feel it. There’s something for everybody! 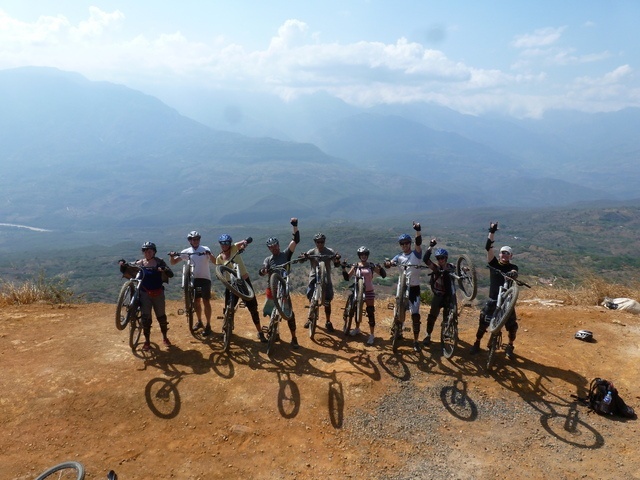 I would love, love, love to do the mountain biking tour! Barichara looks beautiful! It looks like a nice place to go! I am not a bicycle fan but I would love to do some rafting! And hiking, and canyoning, and everything else! So many things to do in Colombia! LOL I don’t know. His name was Remo, and he came along with us from the base. He really loved it. The funny thing is that he kept leaning on me, and I almost couldn’t move because he took all the space. Gorgeous!! He had a blast, just like us! Noel, you should! It is a great place for adventure sports and there are many more things to do in Colombia! It was incredible. And no picture will ever be able to capture the amount of fun I had! Adventure travel is the way to go – you really feel alive when you’re physically active. I understand that the more people work and develop their careers, they need a restful break, but as long as you’re young and full of energy, moving is the way to go!